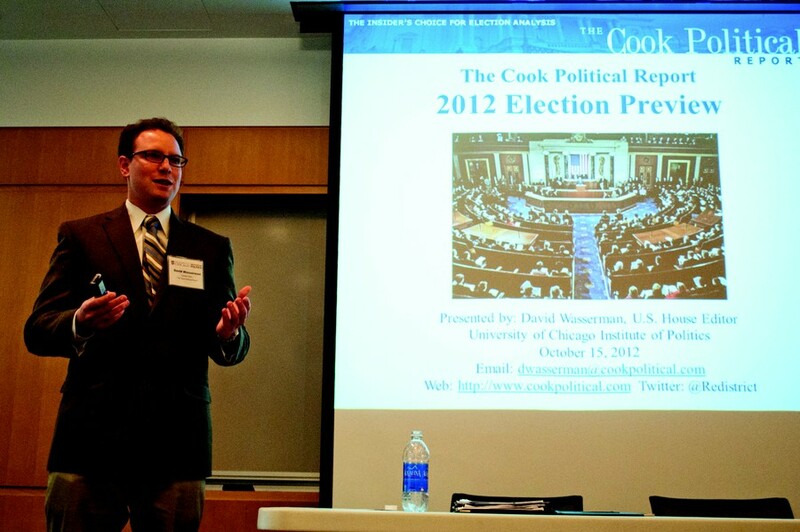 Journalist and political commentator David Wasserman shared his knowledge of national election races at the Gordon Center last night. Wasserman, who analyzes congressional races for the newsletter The Cook Political Report, invited students to play “stump the expert,” followed by gasps as Wasserman responded to a student’s question with a detailed analysis of the factors affecting the race in Louisiana’s 3rd congressional district. “He’s the closest thing to a political science wizard that I’ve seen,” said third-year Charley Kargman after the event. Wasserman forecasts that control of the federal government will remain divided between the two parties into the next term, predicting that Republicans will retain control of the House of Representatives while Democrats will emerge with a slim hold on the Senate. He put President Obama’s reelection chances at 60 to 70 percent, but urged audience members to look beyond the headlines of the day and to examine the underlying forces shaping the 2012 election cycle. Wasserman explained that the last three election cycles have been “wave elections” where one party has seen tremendous gains on election night. However, he believes that this year will be different, more like a whirlpool. “There’s a lot of churning around and a lot of change that’s not going to work exclusively in one’s side’s favor,” he said. He identified the ebb of the Tea Party, the emergence of majority non-white districts, and an improving economic outlook as trends that favor the Democratic Party. Wasserman then pointed to the decline of moderate Democrats, redrawn congressional districts, and confinement of Democratic support to urban areas as factors likely to aid Republicans. Students eager to forecast the winner of the presidential election should pay particular attention to the election returns of Vigo County, Indiana, which has voted for the winner of every presidential election since 1956. Because Indiana lies in the Eastern Standard Time Zone, Vigo County’s results will be announced early on election night. The Institute of Politics, which co-hosted with UChicago Careers in Journalism, will officially open its doors in early 2013, but will host events throughout fall quarter.